OK, so this post is probably going to be mostly opaque to non-programmers, but that's fine. It's a rant. You don't have to understand it. Any way, time goes on and I move on to other things. Eventually I'm asked to come back and help clean some things up. And a mandragora visited our booth! How cute!!! Two more days!!!!!!!!!!!!!!!!!!!!! Come see us!!!!!!!!!!!!!!!!!!!!! Booth #5001!!!!!!!!!!!!!!!!!!!!!!!! Yes!!!!! How Cute!!!!!!!!! And this certainly seems professional!!!!!!!!!!!!!!!!!!!!!! And not desperate for attention!!!!!!!!!!!!!!!!!!!!!!!!!! Of course, if they really wanted attention, they'd release more details about Final Fantasy XIII or announce Kingdom Hearts III or something. Read more about SQUARE ENIX is Professional!!!!!!!!!!!!! Interestingly enough, Facebook can import RSS feeds, so I've pointed my account at my existing blog, which I post to almost never. Maybe I'll post more often. Somehow I doubt it. And no, I'm not really up this late. With the addition of trophies, it was inevitable that eventually Sony would copy the online profile aspect of Xbox Live. That's it. An avatar, your user name, and what would be an "about me" message if I ever bother to fill it in. "Comcast Doesn't Interfere With Active Network Connections"
Comcast claims that they don't interfere with active network connections. ORLY? Read more about "Comcast Doesn't Interfere With Active Network Connections"
Take a wild guess as to which is which. 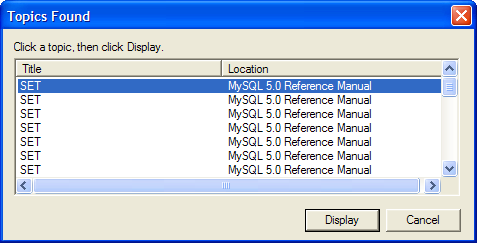 In case you're wondering, every other line if you scroll down reads "SET" with a location of "MySQL 5.0 Reference Manual." Unfortunately, I want to support Internet Explorer, so I attempt to change it to an HTML 4.01 Strict page. No-go: Visual Studio decides it's still XHTML Transitional and starts bitching about missing items. Real Life moves east. Ish. Or not. I'm noting I don't have a category for web comics. Oh well, I don't cover a lot of information on them anyway. Anyhow, Real Life comic's Greg Dean is moving to Texas, which while technically is east of California isn't exactly east. It's more "center" if you're only looking at the US or "west" if you're looking at the globe. But in any case, I don't really care about that. Instead I want to complain about the concept of making Real Life a "full time" job. Read more about Real Life moves east. Ish. Or not.